It's amazing how far a parent's support can go. Whether it's cheering your child on during soccer, building her confidence for a recital, or encouraging her to try a new instrument, the effort you put into her growth can influence her success. 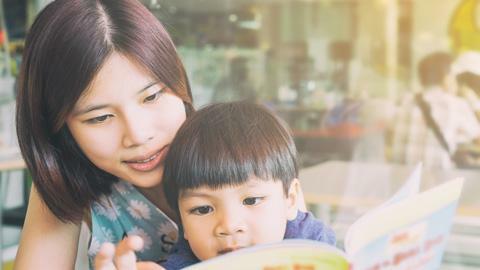 In a country obsessed with private tutors and extra-curricular classes, psychologist-educator Queena N. Lee-Chua explained that home and family still play the most important role in a child's learning. After conducting her own study with family counselor Maribel Sison-Dionisio at Ateneo High School, she discovered some very surprising factors in what makes a little achiever. The time your child spends with you, not with his tutor. Lee-Chua found out that more than 80 percent of honor students never had a professional tutor. Instead, they had their parents. "The first 10 years of our (children's lives) are essential not just for building relationships, but for developing good study habits as well. Investing time and effort, especially in the early years, (provides) a steady foundation for lifelong learning and may prevent future problems," she wrote. A place of her own and the right materials. Surrounded by technology, children these days are accustomed to watching TV, browsing through the net, playing games, or listening to music as they study or do projects. But Lee-Chua didn't agree with achiever kids who thought they performed better with these distractions. For them to really concentrate and learn, she recommended a quiet place to study with a solid routine. She also advised providing enough educational materials for children to turn to. Books, websites, shows, and even games can make learning easier and more fun. Reading to your child helps too. Short chats and long discussions. Encourage your child to talk to you about anything. Ask her about what happened in her day. Get to know who her friends are. Learn about her hopes and dreams. Showing interest in what she likes can give you the opportunity to help her set personal goals that you can work with together. Involving your child in family discussions is important too. It sounds like a big step, but actually exchanging opinions – even if you feel you are right and your child's idea conflicts with yours – shows that her thoughts and feelings count as much as yours, boosting her self-confidence. Talking about both the big and little things in her life will not only make her more open to you, but it will also help shield her from peer pressure as she grows older. Your support in the face of challenges. No one is perfect, and your child will eventually encounter a challenge she'll find difficult to overcome. The important thing is to remain loving and supportive. Lee-Chua wrote, "Unconditional acceptance is the rule –however, acceptance is not enough. When their child gets low grades, parents do their best to help (by tutoring him themselves, researching reference materials, consulting the teacher, or rethinking the balance of academics and extra-curricular activities)." It's also important to never compare your child with others. Instead, instill in her the belief that she creates her own success. It's not a matter of genetics, luck, or talent. Rather, it's about putting in the effort to rise above mediocrity. And it doesn't hurt to celebrate successes, either. Your child's love for learning starts with you. You play the biggest role in shaping her attitude, and it's you she'll turn to for the most support. So remember, the more you give, the more your child can achieve. • Lee-Chua, Q. N. (2004). "How to Help Kids Do Well in School." Philippine Daily Inquirer. Accessed on 16 Dec. 2015.